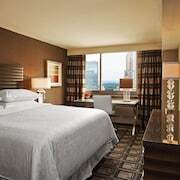 With a stay at Executive Class at MTS Hotel in New York (Midtown), you'll be minutes from Ed Sullivan Theater and Rockefeller Center. 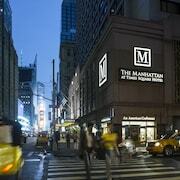 This 4-star hotel is close to Broadway and Times Square. Make yourself at home in one of the 36 individually decorated guestrooms, featuring refrigerators and espresso makers. 55-inch flat-screen televisions with cable programming provide entertainment, while complimentary wireless Internet access keeps you connected. Private bathrooms with bathtubs or showers feature designer toiletries and bathrobes. Conveniences include safes and complimentary newspapers, and housekeeping is provided daily. Satisfy your appetite at a coffee shop/cafÃ© serving guests of Executive Class at MTS Hotel.